BONUS DOWNLOADS: The book comes with over 50 downloadable high resolution illustrations that explain the key concepts in a clear and fun way. You are free to use these pictures in internal presentations, training materials, newsletters etc. Would you like to know how to launch and run an internal social network without falling at the first hurdles? Internal social networks and social intranets are an efficient way to share information and collaborate inside companies. Yet most corporate social networks struggle to get off the ground or sustain the initial momentum. One key problem is that corporate social networks like Yammer, Jive, Socialcast are treated as IT projects or approached as traditional intranet implementations. In the book I draw from “softer” movement building and community management techniques that social champions have used both in big international conglomerates as well as smaller expert organisations. There is no silver bullet for turning your organisation into a collaborative social business, but there are techniques that help you sow the seeds of change in a more fertile ground. You can make a big difference one small step at a time. I like to offer my books with bonus downloads. At the moment those bonus downloads are cartoons (the book has a lot of cartoons) and they’ve proved very popular, but I might offer something else in the future. So if you want the cartoons you might want to buy now! Thanks, Virpi, for putting me out of a job! As a social media specialist, I’m often asked (particularly by B2B clients) for some tips on how they can get an internal social network to take hold and gain traction. Now, I can just recommend this e-book – it is, quite frankly, excellent. Well done! Great book by Virpi! The comics give a clear pictures of the hurdles to overcome when introducing an ESN. Her thorough research provides you with a bunch of tips that you can immediately apply to steer your community to success! 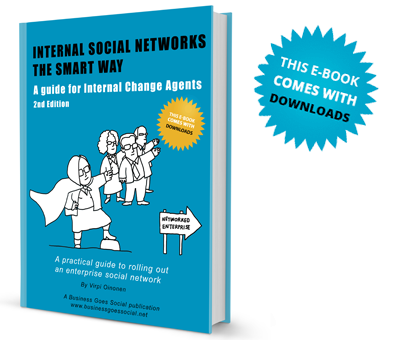 The book is not going to help you magically turn your company into a fully networked “social business”, but it will help you build social inroads into the old system and speed up the process of change that will eventually turn your organisation into a truly networked enterprise. Hope you find it useful! Want to make copies of the book for your colleagues? Download the enterprise version. Lots of useful stuff here, particularly the case studies and interviews with people who’ve successfully introduced ESNs into their companies. Brings clarity and focus to what can be inherently complex subject matter. And using cartoons and info-graphics to explain key concepts was not only helpful to me, but made a lot of my colleagues smile too. They are pretty cool. One final thought – maybe in the next version there should be more stuff on measuring ROI – it’s what gets the bosses’ attention. This book is a must read for anyone who is thinking about introducing an internal social network, who has got stuck or has an interest in the topic. Virpi’s unique style and brilliant illustrations guide you through and leave you feeling ready to face whatever is ahead for your organisation.